Jewish Christians of the first century struggled with being dependent on traditional religious practices, the work of the Levitical Priesthood, and the temple sacrifices. Years later, the Roman Army would destroy the city of Jerusalem and the temple rites that these Jewish believers observed. 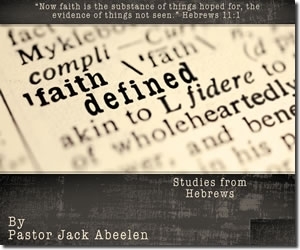 With this in view, it was obvious that the recipients of the book of Hebrews would be forced to learn to walk with God by faith and not by the works of the law, which they could no longer do because the Temple would be gone. This series is a great faith builder.